FOH engineer Phil Gornell has worked with the band for five years in which time their live productions have grown steadily together with their enthusiastic fan base. The band return to the USA for a headline tour in early 2014, on the back of the huge success of the latest album and with an ever-expanding audience stateside. Gornell’s first few years with the band included numerous club tours on what can properly be described as the European ‘toilet scene’, and he recalls clearly the first time that there was a budget available to tour consoles. "It was a no-brainer to go to Adlib," he comments. "I needed a supplier that truly cared, that could help me develop and would be there if I needed them … and to this day, Adlib still meets all of these criteria and more!" With Adlib providing dry hire for the tour it made sense for them to also supply the Brixton system, a venue in which Gornell has mixed a few times, and knows how tough it is to get "perfect". They opted to fly a sub-heavy L-Acoustics V-DOSC system comprising nine V-DOSC speakers a side with three dV-DOSC under-hangs left and right, ARCS outfills and dV foot fills, together with six SB28s subs a side, all processed via a standard Adlib rack containing Lake LM44s and LM26s for EQ, time alignment, etc. The system absolutely rocked – along with the band - powered by LA8 amplifiers and engineered by Adlib’s very own Kenny Perrin. Kenny had it "up and singing like a champ in no time," recalls Gornell, adding that the system easily threw to the back of the room covering the copious balcony. "There’s some wild acoustics through that room so keeping a tight, consistent low end is essential," he continues. They set the crossover point reasonably low so the kick worked the V-DOSC’s 15 inch drivers and remained tight. Working with Adlib on the tour gives the "peace of mind and the right quality levels" to bring a consistent audio world states Gornell. With no patch system or tech, he and monitor engineer Oli Hutchinson have to pick up any slack at their respective ends, and having the Adlib stage and line system onboard means they can get support bands up and running in 10 minutes without having to un-patch anything from BMTH’s set up. "A few simple Veam changes and we are flying". He spec’d the Midas PRO2 supplied complete with DL251 stage box for the tour having first used it last year, when he was immediately blown away with its punch and clarity. "The preamps are fantastic, the EQ is musical and the GUI makes it so easy to navigate". Gornell is also a studio engineer and works out of Steel City Studio in Sheffield. Onstage monitor engineer Oliver Hutchinson was initially apprehensive when his first choice of side fills were not available and instead he was offered three of ADLIB’s FD2’s per side. However any doubts soon evaporated at the first gig! "From the very first second I fed in just a bit of Matt (Nicholls)’s kick drum I was filled with resonant joy – somewhere between 60 and 90 Hz!" he enthuses. 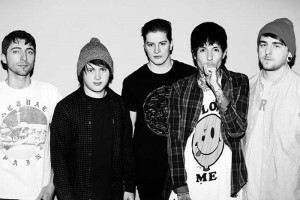 However complete shock followed when lead singer Oli (Oliver Sykes) actually asked for them to be turned down – something he was confident that he would never hear from Sykes. The flexible package of the Adlib side fills per side allows him to adjust the horizontal dispersion whilst retaining impeccable frequency response and feedback rejection. "From the largest of purpose built euro-halls to the smallest of squat-vibe venues, those Adlib side fills have got me through every gig of the tour, hugely impressing Oli Sykes along the way!" he declares. That was all except one day -. when Gornell decided to ‘steal’ Hutchinson’s pride and joy and use them as the venue’s PA, for which they proved equally awesome. Adlib account manager Phil Kielty states: "Watching any band evolve is exciting but seeing Bring Me The Horizon up their game and take their live show to other levels of energy, has been totally amazing. Phil Gornell is an exceptional young sound engineer and they have a great team around them with a hugely loyal fanbase. Bring on 2014!"